At the end of Sunset Boulevard, faded movie star Norma Desmond is lured from her house to answer for her crimes by a staged press conference and the promise of a movie that's never going to happen. Forty years after Billy Wilder made his classic tale of a Hollywood delusion, Iranian director Abbas Kiarostami has flipped the idea on its head. What if the movie is still fake, but the crime is real? What if instead of a movie actress trying to get back in front of the camera, it's a regular joe trying to get behind it? Close-Up is the story of Hossein Sabzian, a print maker who convinces a middle-class family in Tehran that he is filmmaker Mohsen Makhmalbaf. 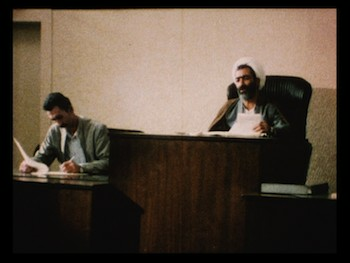 Makhmalbaf is a renowned Iranian director, at the time best known for his 1987 film The Cyclist. 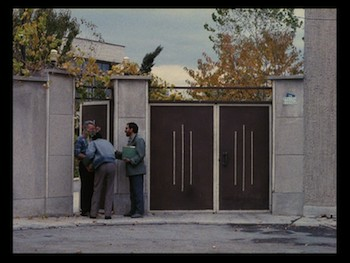 The fact that the identity Sabzian adopts is that of an actual person is one of the many layers that Kiarostami, who also wrote and edited Close-Up, overlaps to obscure the separations between fiction and documentary. Hossein Sabzian is even the actor's real name, and when we finally do see the real Makhmalbaf, they really do look alike. Which probably helped when he actually did pretend to be him once upon a time. Because, oh yeah, this is based on true events. 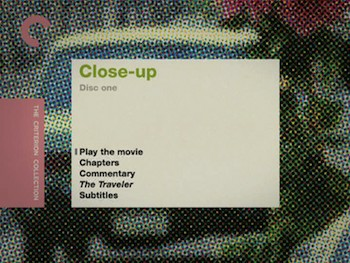 The restored video transfer for Close-Up is presented at 1.33:1, full frame. It looks very good, and though it is seemingly inconsistent as far as surface quality, it looks that way because it's actually how the movie was shot, with the courtroom scenes in particular being more grainy. There are a few scratches or hairs here and there, but nothing outrageous and likely this represents the best that could be done with the available source material. The original Persian soundtrack is presented in mono, and it is clear and free of glitches. The subtitles are surprisingly easy to read given the speed at which some of the actors talk. Close-Up - Criterion Collection is a two-disc release, packaged in a clear plastic case with double-sided covers. The case is normal sized with a staggered tray to hold both discs on one side. Chapter listings are on the inside front cover, with cast and crew credits inside the interior booklet, which also has an essay by critic Godfrey Cheshire. In addition to the two movies on DVD 1, there is also a full-length audio commentary with Kiarostami experts Mehrnaz Saeed-Vafa and Jonathan Rosenbaum. This is an excellent audio track, as it unpacks all the various pieces of this film to examine how it came together and what it all means. DVD 2 has two documentaries and an interview with Abbas Kiarostami. 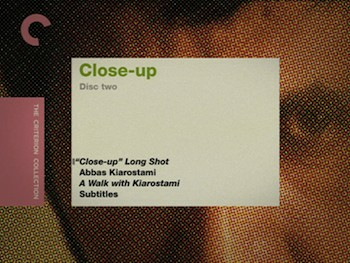 The disc leads with "Close-Up" Long Shot, a program catching up with main actor Hossein Sabzian six years after the film's production. 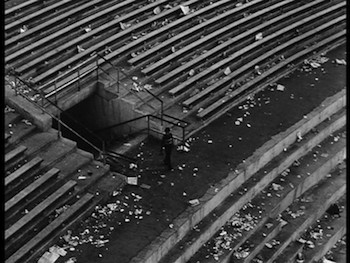 "I intended to devour cinema," the man says, "and it ended up devouring me." Over the 43-minute featurette, the filmmakers talk to people who knew Sabzian before and after Close-Up, as well as during the incidents that inspired the film. They are all baffled by the strange man, who also baffles himself. By his own estimation, he has given up everything for his love of movies. He even quotes Orson Welles as justification for his fraud! 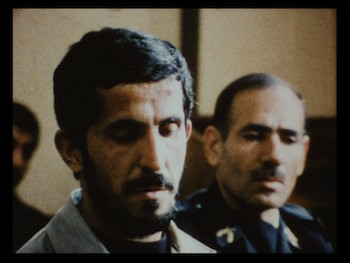 Abbas Kiarostami is the focus of the other two supplements. First is a 27-minute interview with Kiarostami that catches up with the director two decades later for a look back at how this film came about and what it meant in terms of his overall career. 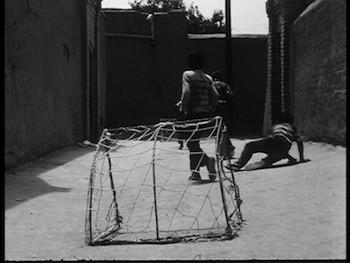 Next is Jamsheed Akrami's A Walk With Kiarostami, a 31-minute documentary shot in 2001 while the subject was in Ireland to attend a film festival. 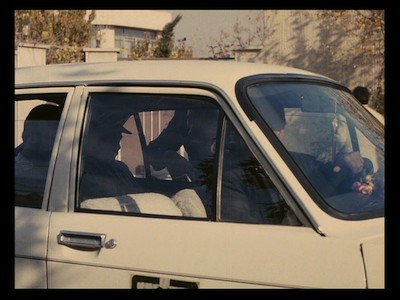 Abbas Kiarostami's Close-Up is an intriguing, insightful blending of fact and fiction that explores what the love of cinema does to people and how the act of moviemaking can warp reality itself. 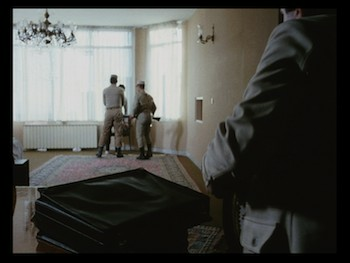 Cutting between faux-documentary segments and "re-enactments" of the crime at the center of the plot--a man pretending to be a famous movie director--Kiarostami creates his own fiction and his own reality all at once, and the convergence of both becomes a comment on human nature. This Criterion double-disc is packed with illuminating extras, including a whole second movie--Kiarostami's 1974-debut The Traveler. Highly Recommended.